This Langley test pilot and engineer prepare to conduct research in the air in 1920. In this historical photo from the U.S. space agency, goggles at the ready, this Langley test pilot and engineer conducted research business high above the ground. 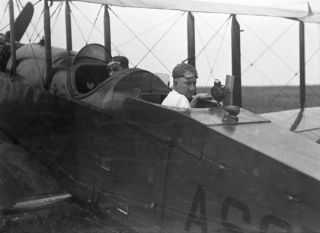 In the early years the flight research team was usually made up of a test pilot (Thomas Carroll, front cockpit) and an engineer (John W. Gus Crowley, Jr.).